We at Patios Plus understand that your purchase with us is an investment, one that will allow you to enjoy your outdoor space for many years. With these tips, we hope to help you keep and enjoy your purchase with us for many more years. Remember, patio furniture needs to be cared for and maintained like anything else you leave outside, much like your car. A vehicle gets dirty from the elements and the more care and attention you pay to its maintenance, the better it looks. This also holds true for outdoor furniture. Protecting your furniture: Many of our clients are here only part of the year and like to put their patio furniture away during the summer months. We want to inform you that storing your furniture in your garage is not always the best choice for your fabrics and sling furniture. Unless the garage is air conditioned, the interior can function like an oven and bake your furniture, creating burn marks on certain fabrics. If you can store pieces inside, where they can be better protected, the longer they will last. Otherwise, they are better off being covered and left outside in a shaded area. The same goes for frames and tables you choose to leave outside. Your furniture will do best if you can pull it out of the direct sun and under any overhang close to the house. We sell a number of covers in different sizes, so remember to measure your pieces before coming in to select a cover. Cleaning your cushions: Sunbrella fabric is a water- resistant fabric, but it is not waterproof. 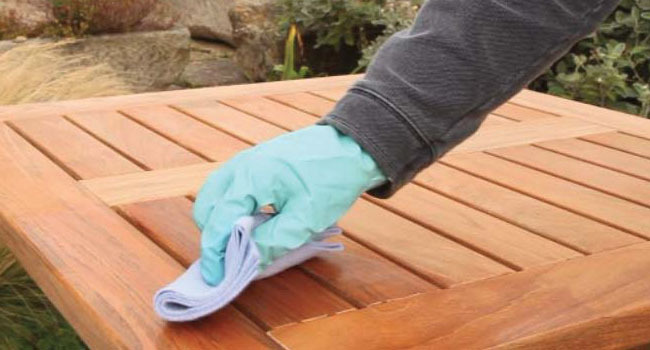 There are some great products out there that you can purchase to repel liquids from your fabrics – especially the popular 303 line of patio furniture cleaners. However, you can also clean fabrics at home with a scrub brush and mild soap and water. Review and download our Sunbrella Stain chart to learn how to get out those tough spots. Regular vacuuming once a week will help keep your cushions look newer longer. Hosing them once or twice a month will also add to their longevity. The most important thing to remember when taking a hose to cushions is to prop them up on their side until the water runs clear. Once they have been thoroughly cleaned, leave them on their side to dry, then flip them on their opposite side for the water to drain without leaving water marks. Cleaning your slings: When it comes to sling furniture, it also important to hose off these pieces periodically to remove any sand or dirt build up in the material. Also, remember to buy cleaning products that specify sling material to prevent stripping the furniture’s protective coating. Open weave sling fabrics will break down faster in the elements, so if you are in an area that gets full sun, choose a tighter woven sling fabric. Like any other fabric, if oil or lotion gets on the sling directly, it can cause the fabric to burn in the sun. Always remember to use a towel when applying oils and lotions. Cleaning your frames: Frames can easily be brought back to life with a little Car Nuba car wax. However, if you live out in the greater desert area, there is a lot of calcium in our water, which can leave behind little white spots of calcium build up. These deposits are more noticeable on darker framed furniture, so selecting a lighter finish may require less maintenance. It is important to wipe off water with a towel to prevent spots – or, clean it with 303 Patio Furniture Cleaner.